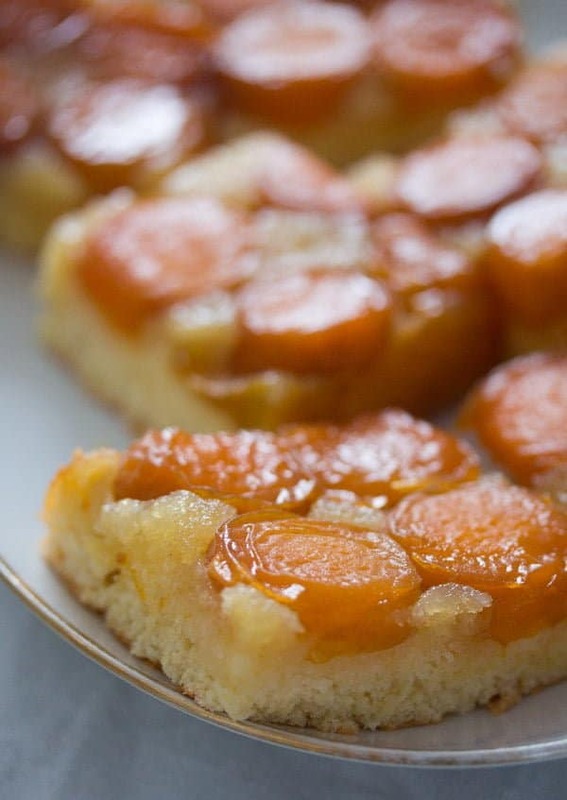 This upside down apricot cake with fresh apricots is one of the easiest cakes I have ever made. And such a delicious recipe I could make it every week. Last updated in June 2018. No kidding, I love this cake so much I could easily eat it every week for a while. And it is so quick and easy to make that if it wasn’t for all the other cakes I would like to try, I could really make this every week. It takes about 15 minutes to prepare everything and the steps are so easy that even my 5 year old daughter was able to make this cake almost on her own. I just had to help with cutting the apricots (the knife is too sharp) and breaking the eggs (she makes a mess out of them if she tries it alone). And turning the cake onto the serving plate is also not something kids should do. 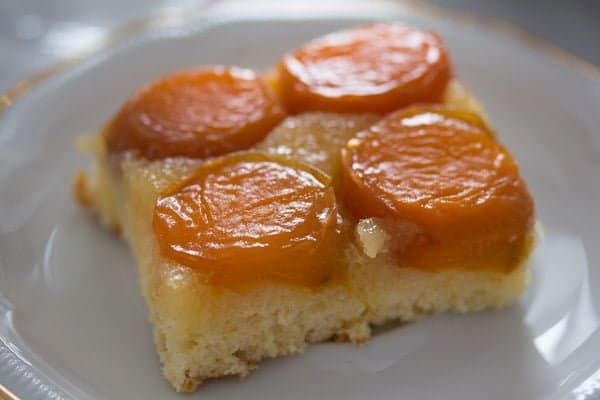 So this Upside Down Apricot Cake with Fresh Apricots could be a good idea to try if you like baking with your children. Mine love to do it, not only baking but cooking as well, and would do it every day if I let them. I don’t always do, because baking and cooking with kids tends to take more time than I would usually need on my own and it definitely tends to get messier, but we do it often enough and I love to see how much they enjoy themselves in the kitchen and how proud they are of the results of their work. I think Perla told every single person she saw during the following days after baking this cake, that she did that on her own and that it was the best cake ever. This is another old recipe I found in Silvia Jurcovan’s Cookbook, I told you a bit more about her a few weeks ago in this post for the Greta Garbo Cake. Just like that cake this Upside Down Apricot Cake was spot-on, just perfect! I posted this cake last summer. However, I can’t help but thinking that although I found this cake very easy to make, many people didn’t really understand how exactly it goes. I have to admit that making this cake involves a few unusual steps, not difficult at all, but different than what we would normally do when baking a cake. So, I’ve decided to bake the cake again (for the probably 10th time already) and take some new pictures, including some step-by-step pictures. I really hope they will help to better understand the way to make this cake properly. I chose to make it with apricots because apricots happen to be plentiful at the moment and we all love them so much, but you could make this cake any time of the year and with whatever fruit you happen to have. You could try it with sweet or sour cherries, nectarines or peaches, apples, plums and so on. Let me know if you do, I am curious to see what you have tried. One point some of the comments mentioned was the butter. Where to put it, how much of it, why they cannot find it in the batter instructions. The butter in this recipe does not come into the batter of the cake. The only thing you have to do with the butter is to use it to smear the baking dish really thickly. There are 100 g/ 3.5 oz/ 1/3 cup + 1 tablespoon butter and that seems like a lot for just greasing the pan. The original recipe recommended using between 100 g and 180 g/ 6.3 oz/ 3/4 cups butter for greasing the baking dish. I ever only used 100 g and never found it to be too little or too much. It is a lot for that purpose, I have never used 100 g just for greasing a baking pan before, but this is just the way this recipe goes. You will have a thick layer of butter in the pan, which you will then sprinkle with a rather thick layer of granulated sugar. The halved apricots come on top of the sugar and they will cook halfway in this butter-sugar mixture before you actually add the batter on top. 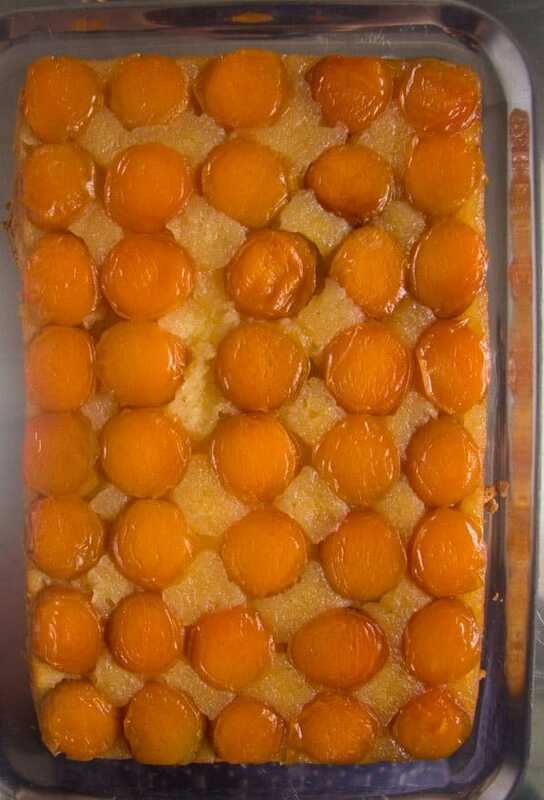 In the next pictures you can see how the apricots need to be cooked before adding the batter. They will be in the oven for about 20-25 minutes, depending on your oven and the size of the apricots, until they start to get soft and wrinkly on top. The sugar and butter will have melted together by this time, forming a sweet and buttery sauce for the apricots. Now it is time to make the batter. Separate the eggs and beat the egg whites shortly before the baking time of the apricots has come to an end. The apricots will need to cool for about 3 minutes and during this time you can mix the rest of the ingredients for the batter and carefully mix everything together. Again: there is no additional butter in the batter. 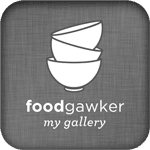 Be very careful when folding the egg yolks and the flour mixture into the egg whites, use a hand whisk and not an electrical mixer for this purpose and do it as gently and with as few movements as you can. 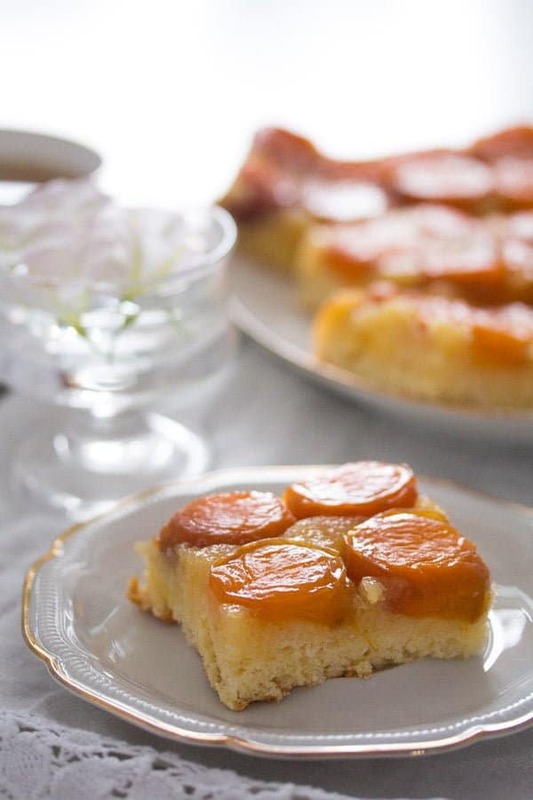 This will ensure that the cake will rise nicely, giving you a soft and fluffy bed for the aromatic apricots and their sweet topping. 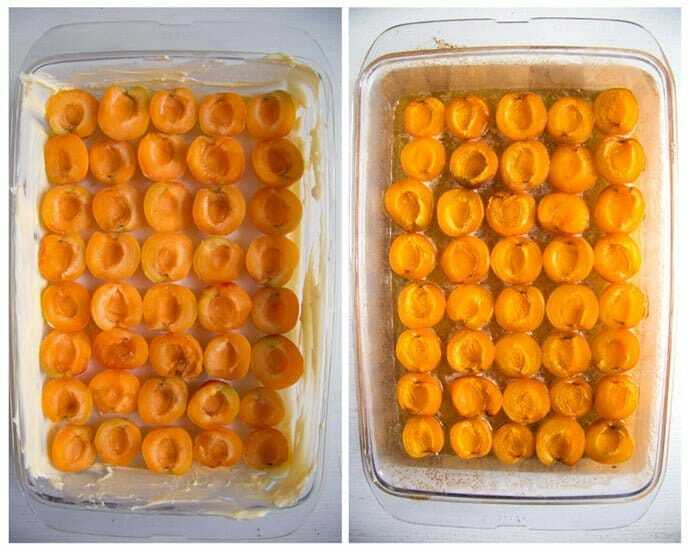 Carefully pour the batter over the cooked apricots and return the baking dish to the oven. 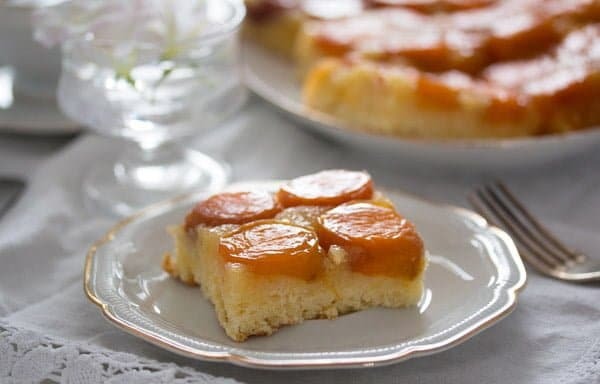 Continue baking the fresh apricot cake for 30 minutes, taking care not to open the oven during the first 20 minutes of the baking time. This might cause the cake to sink and that would be a shame. After 20 minutes, you can check the cake if absolutely necessary. If you have the feeling that the cake has too much color already, reduce the temperature of the oven to 160 degrees Celsius/ 320 degrees Fahrenheit. This also depends on your oven. 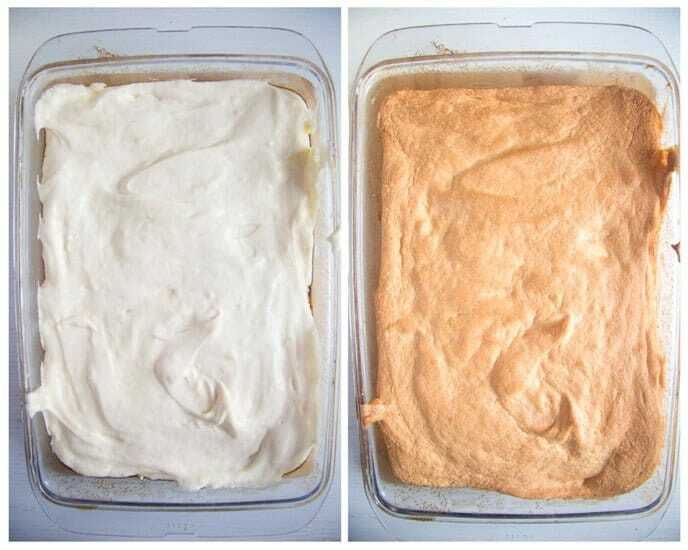 Mine is weird, sometimes I have to reduce the heat because the batter is too dark, sometimes I don’t… However, the cake should have more or less the color you can see in the second picture above this paragraph. If you check the doneness of the cake with a toothpick or a skewer, don’t stick it in too deep. It should only be inserted in the batter layer. The cake is ready when the toothpick stuck in the batter layer comes out clean. After removing the cake from the oven, let it stand for 5 to 10 minutes. Then run a butter knife around the edges of the cake to release it. Choose a rectangular serving platter that is a bit larger than the baking dish you used. Place the platter on top of the baking dish. Make sure you wear oven gloves when you turn the cake onto the platter, the baking dish will still be very hot. So, when the platter is on top of the baking dish, grab both the platter and the dish and carefully but quickly turn the cake around. The apricot cake will fall onto the platter. Remove the baking dish. 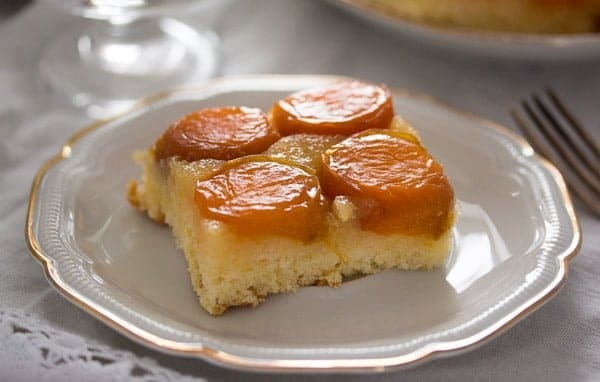 Now you will be able to see the three layers of the cake: the soft cake layer, which should be fluffy and nicely risen, the apricot layer and between the apricots the butter-sugar layer. At first glance, you might think that the cake is undercooked, because the butter-sugar layer will look rather wet. But it is not undercooked or wet, it is just glossy because of the butter and the sugar. Have a look at the picture below. 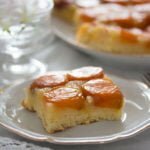 I really hope that I have done a better job this time in explaining this wonderful Upside Down Apricot Cake with Fresh Apricots better. And in case you would like to try some more super easy to make cake recipes have a look at this Apricot Jam Crumble Cake, this Blitzkuchen or at The Easiest Cake Ever, all more or less suitable for baking with children as well. Preheat the oven to 180 degrees Celsius/ 360 degrees Fahrenheit. 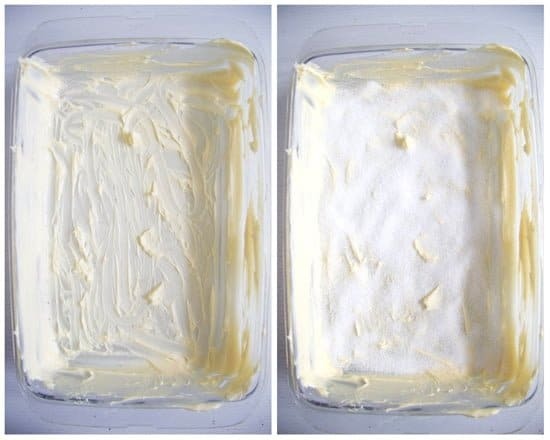 Take a rectangular baking dish of about 21x32 cm/ 8x13 inch and smear with the 100 g/ 3.5 oz/ 1/3 cup + 1 tablespoon butter all over, bottom and walls of the dish. You will have a thick layer of butter all over. Sprinkle 100 g/ 3.5 oz/ 1/2 cup sugar only on the bottom of the baking dish. Halve the apricots and remove the stone. If the apricots are very large, you could quarter them. 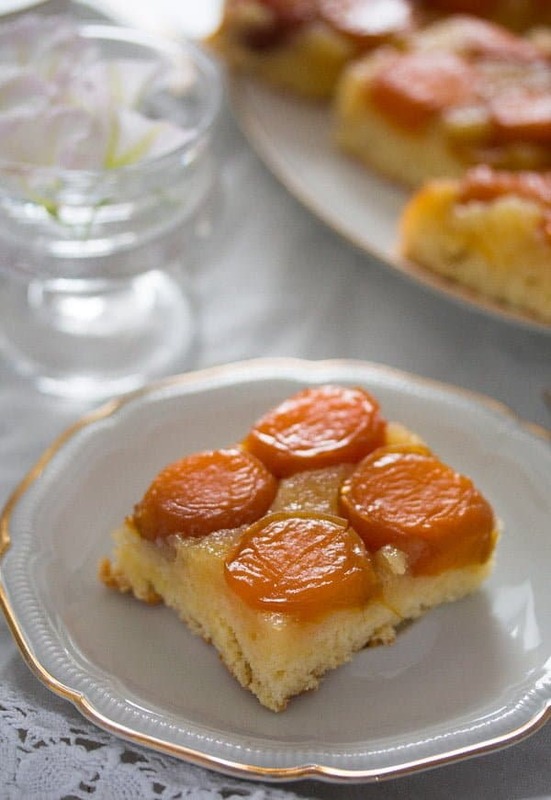 Place the apricots on the sugared pan carefully, cut side up, taking care not to disturb the sugar too much, the sugar should not come on top of the fruit. Bake for 20 to 25 minutes or until the fruit starts to get soft and wrinkly on top. Shortly before the baking time for the apricots is up, separate the eggs. Beat the egg whites until stiff. Add 80 g/ 2.8 oz/ 1/3 cup + 1 tablespoon sugar and the lemon juice and continue beating until the egg whites are stiff and glossy. Set aside. Take the cake out of the oven. Leave to stand for 3 minutes. In the meantime, carefully fold the egg yolks into the egg white mixture. Use a hand whisk to do this and don't overdo it. Give the mixed flour and baking powder over the egg mixture and fold in very carefully again, you should not overdo it either. Give the mixture over the fruit, level nicely and bake for about 30 minutes. Don't open the oven during the first 20 minutes of the baking time. Check after 20 minutes and reduce the temperature to about 160 degrees Celsius/ 320 degrees Fahrenheit if you think that the cake has too much color already. After the baking time is over take the cake out of the oven. The cake is ready when a toothpick inserted in the batter layer comes out clean. Leave to stand for 5 to 10 minutes. Run a knife around the edges of the cake, place a rectangular serving dish on top of the baking dish and reverse the cake onto the serving dish. At first glance, you might think that the cake is undercooked, because the butter-sugar layer will look rather wet. But it is not undercooked or wet, it is just glossy because of the butter and the sugar. Cut the cake into squares and enjoy warm or cold with some whipped cream on the side, if you wish. I have just put this in the oven, when I realised the second lot of butter didn’t go in. After re-reading the recipe, I can’t find where it goes in! I can’t see the need for more butter though. Hopefully it turns out ok! Hi Julie. The instructions about the butter are at the very beginning. You were supposed to smear the baking dish very thickly with all the butter, but here I have made a mistake in writing something about extra 80 g butter, which after reading the recipe in the book again and again, cannot find anywhere either. Sorry about that. But if you have smeared the form with the 100 g butter mentioned, then everything will turn out ok, there is no additional butter in the batter. Thanks Adina; yes it turned out ok in the end. I think I could use even less butter next time. The batter seemed to be swimming in it! I have just realized why I put there two amounts of butter. The cookbook said that I can use butter to smear on the baking form from 100 g to 180 g. I chose to only use 100 g, but didn’t pay attention when I wrote the recipe on the blog. Sorry about that, I hope the cake turned out well. The proportions in this cake are co.pletely wrong: there is way too much flour. I had to stop adding it because the dough was becoming too thick. And there was no butter in it. Don’t use this recipe! Well, I have made this cake several times and the proportions are right. There is not supposed to be any butter in the batter, you will notice that if you read the recipe. Moi, how much flour did you put in? The recipe says 80 g/ 2.8 oz/ 2.3 cup and I was initially confused and was going to put in 2 cups of flour. However, Google tells me that 80g flour is less than 1 cup, so I think Adina meant 2/3 cup (not 2.3 cups). That’s what I did and the batter turned out fine. You do have to put 100g butter on the dish, and this is a very large amount of butter (much more than you would put if you were just greasing the dish); when baking the cake, the batter mixes in with the melting butter. Note for future bakers: I made the mistake of using a loose bottomed tin….all my caramel escaped! Still looks delicious…have to wait for the birthday boy to confirm the taste. I have had a glut of fabulous apricots in the last 10 days. I have made jam, chutney, stewed some and frozen them, given some away and eaten lots. But still they come! I came across this recipe and made it two days ago for a crowd. It was a HUGE success so much so that I made it again the next day. It is light, tangy and absolutely delicious and the recipe is very clear with foolproof instructions. A keeper for sure! Thank you Adina. Hi Barbara, thank you for your feedback, I am so glad you liked the cake as much as we do. And you are so lucky with all the apricots, they are in season here in June, July, but I can never get as many as I would wish for as they do not grow in Germany (too cold for them, I suppose) and that makes them expensive. I can only buy them in the supermarket, but they are rarely as sweet and aromatic as I remember them from my childhood in Romania. I am very lucky then because I estimate that I would have picked between 25-30 kgs off our tree in the last fortnight. A bumper crop! It has obviously been a good year for them in Melbourne, Australia.